← Costa Rica Real Estate Scam? Or Stupid Tax? Aside from the appendage dangling between our legs – and assuming that Kaitlyn will revert to being a male again once the book is completed, we have something else in common. We visit the GYN floor to see our doctors. I need a new blood pressure med. One that is available free from the government, but requires the approval of a medical specialist to write the scrip. His office is in the Ginecologia floor and his office is labeled as such. I got an appointment about a month ago and paid my first visit. I had been warned that before I could see the doc, a file needed to be started at the hospital where his office was located. We arrived a few minutes before the 8 a.m. appointment. 90 minutes later I was with a clerk who took my vitals – and then some. He wanted to know if I was married, but not to whom; he wanted my parent’s name, my age, but not date of birth; did I go to college; and was I working. I saw the doc – needing one scrip for one med. I came out with four scrips for four meds, an order for a complete urine test, and order for an EKG, and order for a chest Xray, and order for a complete blood workup. 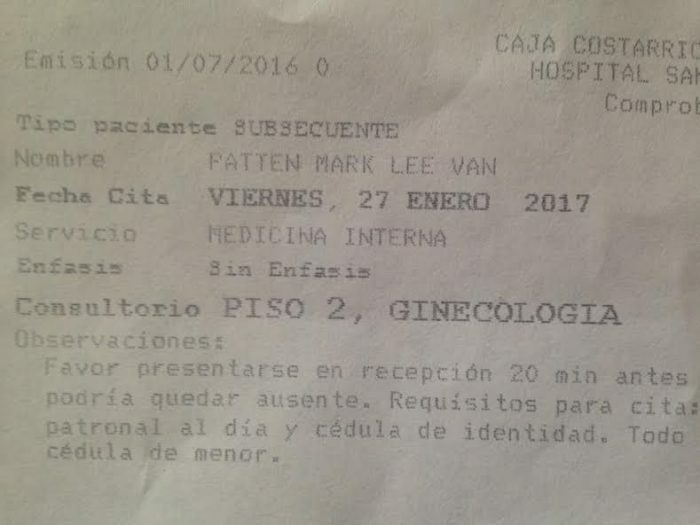 The socialized medicine program in Costa Rica is in bad shape financially. I think we got a clue why. One last “only-in-Costa-Rica” moment. It’s a one year wait for an EKG, but I have to go back in August before they will give me an appointment.